Enter your dates to pick from 44 hotels and other places to stay! The 3-star Superior Hotel La Grotta is set in San Marino’s center, a few yards from the main square Piazza della Libertà. A beautiful property in a beautiful small city. The beds were very comfortable, which is saying something in a country where the beds are usually like sleeping on a board. Complementary breakfast was wonderful, staff was friendly and very accommodating. The young lady at reception was quite helpful in recommending a local restaurant for dinner, Osteria La Taverna, which exceeded our expectations, with excellent food and views from the dining area located in the piazza outside the restaurant. Set in the City of San Marino, Titano Suites Hotel offers accommodations in a 19th-century building, 656 feet from Palazzo Pubblico Palace and the Basilica of St Marino. It features free WiFi. Best possible location. The staff was perfect, kind and helpful. Stunning views! The bathroom looked completely new and modern. The room was better than the pictures on the web site. Everything exceeded our expectations. Located in San Marino, Montegiardino Albergo Diffuso features a shared lounge and a bar. Hotel Rossi offers rooms with free Wi-Fi. It is a 10-minute drive from Serravalle. San Marino city center is 3.1 mi away. Rooms are simply furnished and decorated in a classic style. Great location outside of San Marino proper. Room was clean and accommodating, and location was easy to access. Our GPS did not like the exact location, and you can miss it if you aren't looking, but the signage is easy to see. The restaurant was excellent quality at reasonable prices. Overall, great service and value for the money! Featuring panoramic views of San Marino and Montefeltro countryside, Hotel Joli is just 984 feet from the entrance to the historical center. The location and the breakfast were excellent. I took the 5 Euros bus from Rimini and it was a very short walk to the hotel. 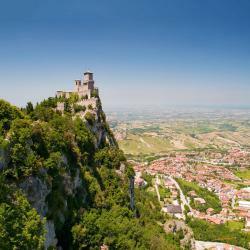 The elegant Grand Hotel Primavera is 2.5 mi from the historical center of the Republic of San Marino. It offers a spa center, meetings rooms and a restaurant. It was nice as well as my expectations. If I wanna back to San Marino, it’s my choice for staying in the country. Featuring free WiFi throughout the property, Hotel La Rocca offers rooms in the historic center of in San Marino. Guests can enjoy the on-site bar. The location and the view was perfect, the room was very clean and the staff very helpful. Decorated with contemporary artworks, Hotel Sanmarino iDesign offers modern accommodations in San Marino. You can reach San Marino center with the hotel's free shuttle, or by public bus. Very pleasant and accommodating staff. Located 2.5 mi from San Marino city center, Hotel Gasperoni offers rooms with free WiFi and free parking space. Public transport is 164 feet from the property, linking to Rimini and San Marino. The hotel is easy to find right on the main road of this country, offers free parking and is a great base for exploring the Republic of San Marino. In less than ten minutes, one arrives at Borgo Maggiore, where one can park the car and take the telepherique or walk up to San Marino. The owners and staff were friendly and very helpful. Neither the hotel nor the furniture are new, but they are well maintained. The attached restaurant has a good choice of dishes. Arriving late, I just had a pizza and a salad, which were good ― small country, big pizza :-) Overall, the hotel is very good value for the price. Offering simple rooms with free Wi-Fi and air conditioning, Hostaria Da Lino features a restaurant serving local and national cuisine. 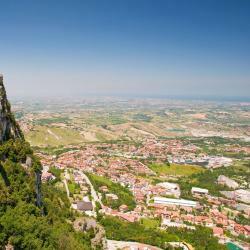 It is located 1.2 mi from the center of San Marino. Excellent, friendly, helpful and welcoming staffs; great location near a hiking trail to city of San Marino; clean, comfy and well equipped room; large en-suite and free towels included; separate building from the restaurant guaranteed quietness; great dinner at great price; good breakfast and great coffee; beautiful neighborhood and lovely locals; strong wifi and supreme air conditioning; best price/performance ratio in San Marino. Set in San Marino's pedestrian area, the Bellavista is the only hotel in the city that has a view of Cava dei Balestrieri where local events, medieval re-enactments and archery take place. Breakfast was great and the location was atop a hill. It was a great walk from Parking lot #6. The views were great and the staff was wonderful. Offering uniquely decorated rooms, free parking and a continental buffet breakfast, Il Monte is 10 minutes' walk from Serravalle Olympic Stadium. San Marino center is 10 minutes away by car. The hotel is in an accessible location, clean and large bathroom. Hotel Dogana is in San Marino, just off the Superstrada Rimini-San Marino motorway, and a 10-minute drive from the historic center. Great location and very friendly staff. Very good breakfast and clean rooms. The Palace Hotel is set on Serravalle's main road leading to San Marino city center. It offers a large congress center, a wellness center and a covered sea-view pool. Actually the Eggs were like rubber and the Bacon was under cooked but everything else was very good. The Grand Hotel San Marino is in the historic center of the Republic of San Marino, a UNESCO World Heritage Site, and overlooks the beautiful Montefeltro Valley. The staff was so very helpful, especially Stefano, the restaurant's food was very good, the view from our balcony was fantastic, the breakfast was excellent, especially the scrambled eggs and pastries, everyone was so nice, we love San Marino, and as a history teacher, it was especially meaningful to me. We hope to come back next year. Set in the heart of San Marino historic center since 1894, Hotel Titano offers views up to the borders of Tuscany, the Adriatic Sea and the Apennines. The restaurant was only open for breakfast which was very good. Hotel Cesare is an elegant hotel, boasting bright interiors and a sophisticated atmosphere. The location was so perfect! And, right beside the hotel there was a gelato place! The family-run Hotel Silvana is set at the top of the republic of San Marino, within walking distance of the historic center. Its restaurant is excavated in the rock. WiFi is free. The staff was very kind. Excellent breakfast. Set in the Republic of San Marino historic center, Hotel Quercia Antica is 1312 feet from the Palazzo Del Governo main square. It has a restaurant with valley views and Wi-Fi is free throughout.